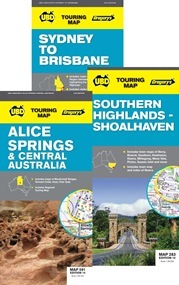 UBD Gregory's, Australia’s leading brand for 75 years of the mapping industry, is a name synonymous with maps, atlases, and guide books. The UBD Gregory's name represents trustworthy and comprehensive products with up-to-date and concise mapping information. 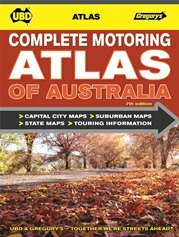 Their extensive range of City, Touring, State and National maps are available in a range of styles and price points. 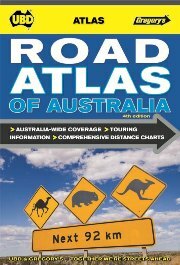 The maps come in a variety of formats and as both standard paper and a tear proof and water resistant stock for durability. 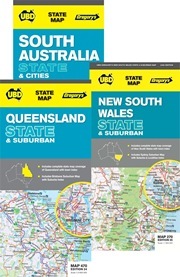 State maps from UBD Gregory’s printed on waterproof and tear-resistant synthetic paper, combining a map of the whole state, enlargements of the Capital region, plus street plans of several local towns. The maps clearly show highways, major roads, route numbers and distinguish between sealed and unsealed other roads. 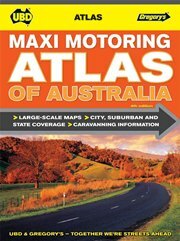 Symbols highlight visitor information centers, camping grounds and caravan parks, etc. Coloring indicates national parks or other protected areas and Aboriginal Lands. 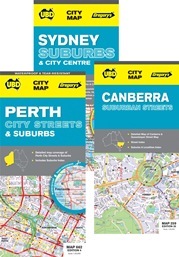 Double-sided maps from UBD Gregory’s, waterproof and tear-resistant, combining a very detailed street plan of the city and on the reverse, a map of the wider environs. A perfect choice for customers who need accurate and extensive mapping in a convenient size. The maps show main road connections, highlights national parks and other protected areas. Symbols indicate locations of various facilities, city highlights, and places of interest. 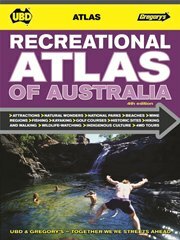 A comprehensive series covering regional areas throughout Australia. 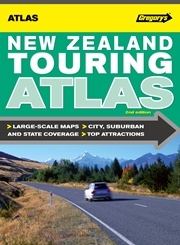 Maps are packed with information for the traveller, including local tourist attractions (National parks and other protected areas), town facts, a local business guide and street plans of local towns. 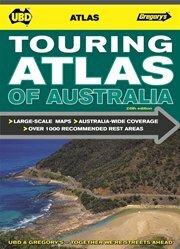 The touring maps are double-sided, combining a touring map and enlargements highlighting various places of interest. 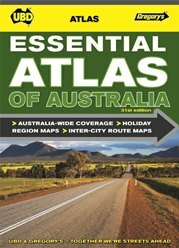 The Essential Atlas of Australia from UBD Gregory’s in an A4 paperback format, with coverage of individual state supplemented by more detailed mapping of the most visited holiday regions, a comprehensive distance table and diagrams of main intercity routes, etc. 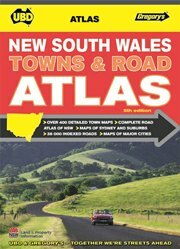 The best atlas at the best price!